recreated for UFO documentary (1956) by Greene-Rouse Productions. Mr. Hall takes no formal position regarding UFOs other than the belief the UFO phenomenon is reality based and constitutes a phenomenon that warrants on-going and UNBIASED scientific investigation by private researchers and the various disciplines in the field of academia. 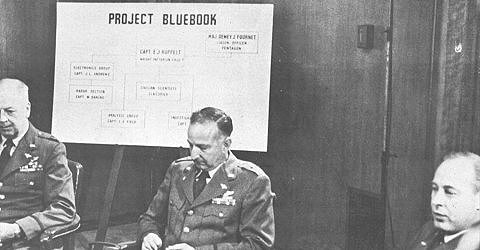 The primary goal of the Center is to share the history of Project Blue Book and the military and civilian personnel who were involved. As research is an on-going endeavor at the Center new information and documents have recently been located that shed new insight on Blue Book's operation. This new information includes insights into the various military and civilian personnel associated with Project Blue Book. You are encouraged to visit this site often as new discoveries and commentary will be posted on a frequent basis. Please enjoy your visit to the Project Bluebook Research Center. Mr. Hall can be reached by any of the following methods listed and we welcome your comments and assistance regarding Project Blue Book. All inquires to Mr. Hall is held in the strictest of confidence. Although donations are graciously accepted for research by Mr. Hall, he believes that exchanging ideas, documentation and insight is vastly more important and the Project Blue Book Research Center has a few items available for purchase to assist in researching the history of Project Blue Book. Mr. Francis Ridge has graciously donated the Project blue bookResearch Center's Web Page. Visitors are encouraged to check out the exciting work being done by Mr. Ridge and the the NICAP website, and the Project SIGN work by Wendy Connors.